Join the discussion on our forums! Come discuss Tess Greymane over in our dedicated Tess Greymane discussion topic. Those who cannot remember their card history are doomed to repeat it. Can anyone explain that why playing Tess Greymane wont effect Aya Blackpaw. New update? Battlecry: If you previously played Academic Espionage, destroy all of your opponent's hopes and dreams. I think I am gonna craft this one when The Boomsday project expansion arrives! Bahaha incredible. Needs The Lich King and Elise the Trailblazer looking over her shoulders. Garbage like Face Collector. Both are meme cards. Don't play them in constructed. in what order does tess plays the cards? I'm thinking about crafting tess, just for fun. (rogue is my favorite class) but does it even make fun? Or is it just frusrating? And if I Shadowstep Tess and play her again, will cards be played 2 times? because one time for the actual play and once for the first Tess? 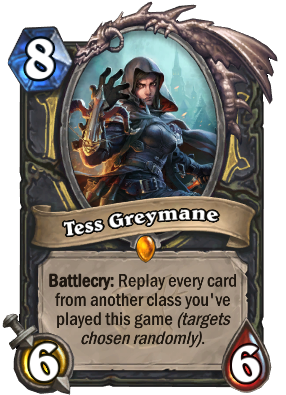 It plays cards from your other classes, not rouge, so Tess would play those cards once. Her stance looks incredibly awkward but I like that she looks like the Demon Hunter in D3. It's worth noting that the replay order follows a "first in last out" strategy. That is, if I played other class cards A, B, then C, and then I throw down Tess, they will be replayed in the reverse order as C, B, and A. This is important if you use a board wipe spell. Plan accordingly!